In this Scalable Capital review, we take a closer look at this fast growing digital wealth manager. This will help you decide if they are the right UK robo-advisor for you. We look at Scalable’s fees, how they invest your money and different types of investment products they offer. We’ll also review their past performance. Finally, we examine how Scalable Capital compare to other UK robo-advisors such as Nutmeg* and Wealthsimple*. The past few years have seen robo-advice really take off in the UK, with various companies entering the market. Today we look more closely at Scalable Capital. Scalable Capital started life in 2015 in Germany, before coming to the UK in 2016. The company aim to bring investment management services to a wider group of investors. They do this by bringing down the costs and fees involved by investing your money in low cost ETFs. They use intelligent risk management technology to invest your money in a way that suits your attitude to risk. Scalable offer a general investment account, but they also offer a Stocks and Shares ISA. They recently received financial backing from one of the biggest investment firms in the world, BlackRock. I would imagine one of the big things attracting you to a platform like Scalable Capital are the low fees. The fee structure is simple and straightforward. Scalable charge a fixed fee of 0.75% per year no matter how much money you invest. The ETFs in which Scalable invest also carry an annual charge of around 0.25%. This is in addition to Scalable’s own fees, bringing the total cost of investment to around 1% per annum. Scalable Capital’s fees include your investment management, account management and all trading or custodian fees. As we can see, Scalable’s fees are low when compared to those charged by typical wealth managers and mutual funds. There are cheaper robo-advisors in this sector, however. Be sure to check out our reviews of robo-advisors like Wealthsimple and Nutmeg. There are no withdrawal or exit fees with Scalable and you are not locked into the investment. This means you can withdraw your investment at any time free of charge. 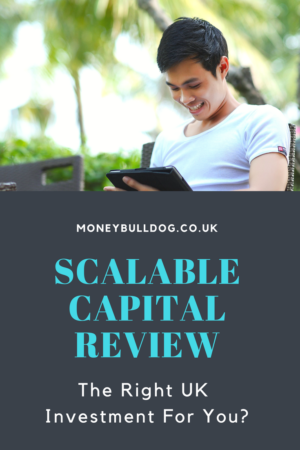 Yes, the minimum amount you can invest with Scalable Capital at the time of writing this review is £10,000. Scalable say that they need at least £10,000 to be able to adequately invest your money across different asset classes. This will then allow them to effectively balance your portfolio. They feel that it is not possible to do this with smaller amounts of money at this time. There is no upper limit to the amount of money you can invest with Scalable. You might be wondering at this point what might happen if you want to withdraw some of your investment? The answer is that – as there is no lock in – you are able to make partial or full withdrawals. Your balance must stay above £10,000, though. To take the balance below £10,000 you would have to withdraw the full amount of your investment. With Scalable’s Stocks and Shares ISA you are able to enjoy the benefits of their service in a tax-efficient way. This means with no income or capital gains tax to pay on deposits up to your ISA allowance. You can use your full ISA allowance with Scalable or you can split it across various ISA types. With their Stocks and Shares ISA offering, Scalable Capital will take care of everything related to your investments. They’ll do this for the same annual fee of 0.75% (+ average 0.25% ETF fee) outlined earlier in this review. You can manage your account online or via their mobile apps. Scalable say they’ll continually monitor and tweak your investments to help you reach your investment goals. One thing you need to know before choosing the Scalable ISA is that you can’t pick your own individual shares. If you want to pick your own specific investments then you might want to look at a DIY Stocks and Shares ISA from a company like Hargreaves Lansdown* instead. Before putting your money into any investment, you will want to know as much as possible about its past performance. Scalable Capital are very transparent on their website in this area. They clearly detail the performance of their risk tailored funds since June of 2016. There are several graphs to view on their ‘past performance’ page and these are also explained in writing. Is Your Money Safe With Scalable Capital? Potential investors with Scalable Capital will want to know whether their money is going to be safe and protected. Scalable are regulated by the Financial Conduct Authority (FCA). This means your money may be protected by the Financial Services Compensation Scheme for up to £50,000. With Scalable, your money is kept in a separate bank account set up when you invest with the company. When it comes to your investments, these are kept separate from the banks own assets. Your assets are never lent to third parties or mixed with Scalable’s own assets. Do Scalable Capital Offer a Pension or SIPP? Unlike Nutmeg*, Scalable Capital do not offer a pension or SIPP at present. There are plans to add this in the near future so watch this space. It’s again worth remembering that you can’t choose your own individual investments with Scalable. If you’re wanting to do this through a SIPP then the Hargreaves Lansdown SIPP* might be a better alternative. There are some UK alternatives to Scalable Capital that you might want to look at. This is especially true if you can’t afford Scalable’s £10,000 minimum investment. One UK alternative to Scalable Capital is WealthSimple*. Unlike Scalable, Wealthsimple don’t have a minimum investment amount. They’re fees are also less than Scalable’s. These start at 0.7% plus ETF costs for investments of up to £100,000. They then drop to 0.5% for investments over this amount. We’ve also managed to secure a special new investor offer for our readers. The offer allows you to get your first £5000 of investments managed free of charge for the first year. To get the offer you will need to sign up for a Wealthsimple account* using one of the links in this post! Alternatively, you could opt for Nutmeg*. Nutmeg allow investment from £5000 when investing a one-off sum or £500 if you pay a further £100 a month. Are Scalable Capital Right For You? We hope that this review has given you a rounded view of what Scalable have to offer. If you’re still unsure whether they are the right option for you, here are a few summarising points to consider. If you would like to pick your own shares and select your own investments then you might be better off going for a Stocks and Shares ISA or General Investment Account from a company like Hargreaves Lansdown* instead, as Scalable do all of the investing on your behalf based on your attitude to risk. For a hands-off investment with the potential for growth, then Scalable could be a great option. But be sure to do your research and check out other robo-advisors to ensure you pick the right one. Moneyfarm Review – The right robo-advisor for 2019? Wealthsimple UK Review: Get Your First Year for Free!